Fresh, vibrant and versatile — we’ll go ahead and name Ahsayane’s EcoChic Pot as this season’s it-bag. Designed as a flower pot made in ceramic, this clever design features a stylish purse string that can be hung inside or outside your home as a beautiful piece of decor. But we say, if you’re really fashion forward (someone send this to Lady Gaga, stat! ), try taking it out for a night on the town — it’s sure to be a conversation starter! Fresh, vibrant and versatile -- we'll go ahead and name Ahsayane's EcoChic Pot as this season's it-bag. 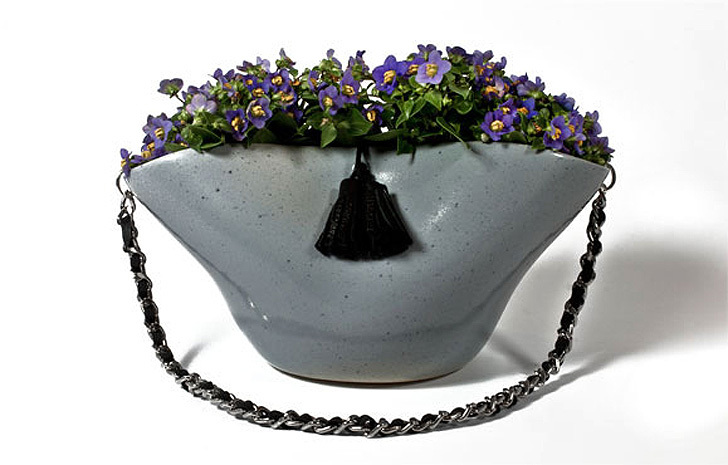 Designed as a flower pot made in ceramic, this clever design features a stylish purse string that can be hung inside or outside your home as a beautiful piece of decor. But we say, if you're really fashion forward (someone send this to Lady Gaga, stat! ), try taking it out for a night on the town -- it's sure to be a conversation starter!